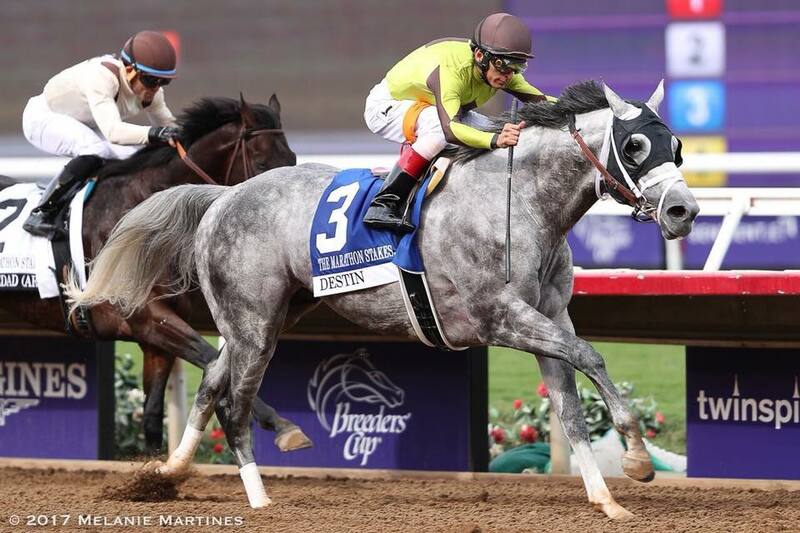 Destin is a track track-record breaking multiple graded stakes winner and classic performer who earned almost $1,000,000. A brother to Creative Cause, a grade one winning two-year-old and classic placed runner who is now a very successful young sire, Destin is by three-time Leading Sire Giant’s Causeway, out of grade one winner Dream of Summer. Destin’s brother, Creative Cause, has already established a strong affinity for Mr. Prospector line mares, with multiple stakes winner Twisted Tom out of a mare by Thunder Gulch (by Gulch); stakes winner Creative Thinking out of a mare by Street Cry (sire of Street Sense and Street Boss); stakes winner Cause We Are Loyal out of a mare by Not For Love; stakes winner She’screative out of a mare by Two Punch (sire of Smoke Glacken); and multiple stakes winner Nikki My Darling out of a mare by Zamindar, a son of Gone West, who might also be found through Mr. Greeley, Speightstown (who gives a well-placed Storm Cat double, and who is also sire of Munnings), Elusive Quality (sire of Quality Road and Smarty Jones) and Proud Citizen. The cross of Destin’s sire, Giant's Causeway and sons with Mr. Prospector line mares has been a tremendously successful one in general. Kingmambo and his son, Lemon Drop Kid are both broodmare sires of Giant's Causeway line grade one winners. The Giant’s Causeway cross with mares from the Carson City branch of Mr. Prospector has done well and can be tried through such as City Zip (sire of Run Away and Hide), Good and Tough, Five Star Day, Cuvee, Pollard’s Vision and Lord Carson. The cross of Giant’s Causeway with mares by Distorted Humor – from the Forty Niner – branch of Mr. Prospector has produced two graded one winners. Distorted Humor is sire of Any Given Saturday, Cowtown Cat, Drosselmeyer, Flower Alley, Jimmy Creed, Maclean’s Music and Sharp Humor. Forty Niner is also sire of End Sweep (also sire of Trippi and Precise End), Coronado's Quest, Twining, Roar, Jules, Gold Case, and Gold Fever. Mr. Prospector son, Seeking the Gold is broodmare sire of Giant’s Causeway’s Champion Two-Year-Old Filly Take Charge Brandi – and he could be brought in through Mutakddim, Petionville and Cape Town. Giant's Causeway has demonstrated an affinity for the Fappiano branch of Mr. Prospector, with grade one winners out of mares by Cryptoclearance (sire of Victory Gallop; grandsire of Candy Ride), Unbridled's Song (by Unbridled) and Defensive Play, and stakes winners from mares by Quiet American (grandsire of Midnight Lute, who could be interesting here), Rubiano and Roy. Unbridled and Unbridled's Song could also be introduced through Broken Vow, Grindstone, Birdstone (giving inbreeding to Storm Bird), Empire Maker, Rockport Harbor, First Defence, Old Fashioned, Half Ours (giving inbreeding to Storm Cat), Dunkirk, Even The Score and Songandaprayer. Giant's Causeway's outstanding son, Shamardal, is out of a mare by Machiavellian, and there is also a grade one winner by son of Giant's Causeway out of a mare by Machiavellian son, Vettori, which also suggests mares by Street Cry, Street Sense and Street Boss. We can also note a graded stakes winner out of a mare by Crafty Prospector (sire of Crafty Friend, Prospectors Gamble, Prospect Bay and Robyn Dancer); a grade one winner out of a mare by Miswaki (sire of Black Tie Affair and grandsire of Formal Gold); graded winners out of mares by Smart Strike (sire of Curlin, Lookin at Lucky and English Channel); graded winners out of mares by Woodman and his son, Hansel; and a stakes winners out of mares by Distant View, Jade Hunter and Fusaichi Pegasus and his son, Roman Ruler. Out of mares from the A.P. Indy line Destin has a stakes winner out of a mare by A.P. Indy himself, and graded stakes winner My Boy Jack out of a mare by Mineshaft (sire of Discreetly Mine and Dialed In, who would give a well-placed inbreeding to Storm Cat). Overall, the cross of Giant's Causeway and sons with mares from the A.P. Indy line has been a very productive one, also working through Pulpit and his sons, Tapit (sire of Tapizar, Concord Point and Trappe Shot) and Purge, which also suggests trying daughters of Sky Mesa – doubling Storm Cat – and Stroll; and through Jump Start (another giving a double of Storm Cat) and Olmodavor. This cross might also work though such as Malibu Moon, Congrats, Flatter and Bernardini. Giant's Causeway also sired the grade one winning Eskendereya out of a mare by Seattle Slew, the sire of A.P. Indy, and a grade two winner out of a mare by Capote (sire of Boston Harbor). Giant's Causeway is a Northern Dancer line stallion, but he and his sons have done well with mares from some other branches of that line. There are nearly 75 stakes winners by Giant's Causeway and sons out of mares from the Danzig branch, with grade one producing crossing including those with mares by Danehill, Anabaa, Polish Express and Bertolini (a three-quarters brother to Green Desert). In North America, crosses that have worked include with Belong To Me, Polish Numbers and Langfuhr, and it could be worth exploring the Northern Dancer/Secretariat cross – a parallel to Giant's Causeway's sire Storm Cat – found via Lost Soldier, Honor Code and Chief's Crown (sire of Concerto and his grandsire of Bellamy Road). Giant’s Causeway and sons have sired more than 40 stakes winner out of mares from the Sadler's Wells, and duplicating that strain should work well, and in the U.S. options include El Prado, Medaglia d'Oro, Kitten's Joy (himself sire of a grade one winner out of Giant's Causeway mare), Artie Schiller, Perfect Soul (a Northern Dancer/Secretariat cross, like Storm Cat) and Sligo Bay (who gives inbreeding to Champion Glorious Song and a sister). Giant’s Causeway and sons have also enjoyed success with mares from the sire line of Nureyev, the three-quarters brother to Sadler’s Wells. There are stakes winners by Giant's Causeway and sons out of mares descending from Nureyev through Stravinsky, Theatrical, Peintre Celebre, Unusual Heat and Pivotal, with Atticus (bred on the same cross as Storm Cat) and Spinning World also being possible. Out of mares from the Deputy Minister branch of Northern Dancer, Giant's Causeway and sons have enjoyed success with Dehere (a Northern Dancer/Secretariat cross, and sire of Graeme Hall), Awesome Again (sire of Ghostzapper), Silver Deputy (sire of Posse, Badge of Silver and Spring at Last), Touch Gold (sire of Mass Media and Medallist) and French Deputy. Out of mares from the Halo line, Giant's Causeway and sons have three stakes winners, one grade one from daughters of More Than Ready. Giant's Causeway also carries Halo's Champion daughter, Glorious Song, a sister to Devil's Bag (sire of Devil His Due and Diablo) and Saint Ballado (sire of Saint Liam, Yankee Victory, Sweetsouthernsaint and Captain Bodgit). It would also be interesting to introduce Cure the Blues, a relative to Halo, and from this immediate family, the most likely source being American Chance. Destin’s brother, Creative Causem, has grade one winner Pavel out of a mare by Maria’s Mon, and there is also a Giant’s Causeway line stakes winner out of a mare by that horse’s son, Monarchos, which also suggests trying daughters of Super Saver. 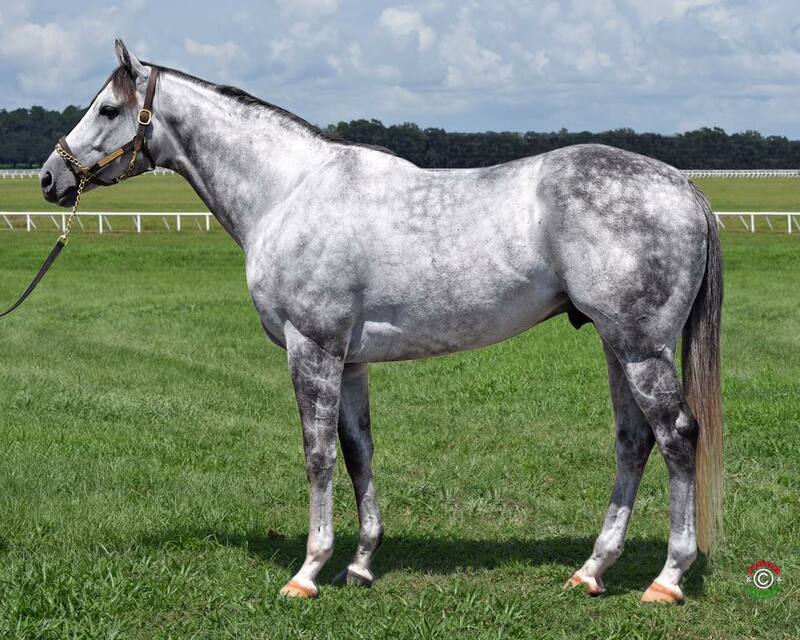 Destin is out of a mare by Siberian Summer, a son of Siberian Express, also sire of In Excess and grandsire of Indian Charlie, and from the Caro male line of Cozzene, sire of Alphabet Soup and Running Stag (broodmare sire of a Giant's Causeway line stakes winner). The Giant's Causeway line has done well with a number of Relaunch line broodmare sires, among them Honour and Glory (sire of Put It Back), Cee's Tizzy, Tiznow, Slew Gin Fizz and Bertrando (sire of Officer). 7f, D, defeating Sea Wizard, Majesto, Wheels Up Now, Warden of the West, Big Gillette, Catamount, Silver Romeo. 8f, D, to Golden Ray, defeating Sumpter, Brighton Lane, Pilot House, Mr. Ellie. 8.5f, D, defeating Outwork, Star Hill, Rafting, Tale of S’avall, Riker, Brody’s Cause, Awesome Banner, Economic Model. 8.5f, D, defeating Rafting, Morning Fire, Awesome Slate, Gettysburg, Whatawonderfulworld. 9f, D to Laoban, Governor Malibu, defeating Mohaymen, Race Me Home, Creator. 9f, D, defeating Donegal Moon, Seeking the Soul, Bodhisattva, Flashy Jewel.